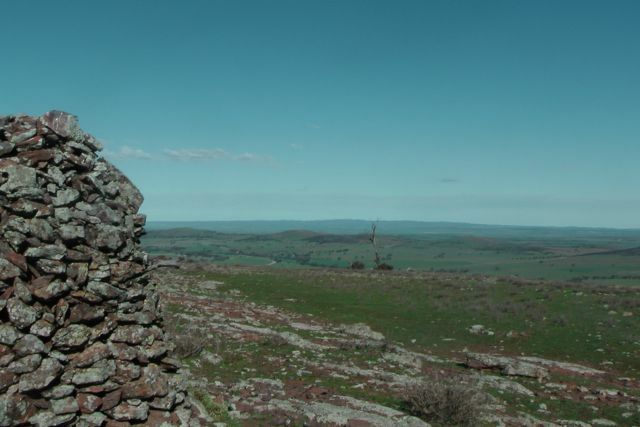 My third planned summit of the weekend with Ian VK5CZ, was Hogshead Hill, VK5/ NE-051, which is situated about 7 km south east (as the crow flies) of the little town of Pekina in the Flinders Ranges, or about 272 km north of Adelaide. Hogshead Hill is about 770 metres above sea level and is worth 4 SOTA points. The summit is situated on private property owned by Gary Hawthorne. Again it was an early start for me. I had stayed overnight at the Orroroo Hotel, and had enjoyed the cold beer and a good feed the night before. In fact probably a bit too much beer, as I was feeling a bit weary. I got up to the horrible sound of the alarm at 6.00 a.m. and almost felt like rolling over and going back to sleep. But after a nice warm shower and a hearty breakfast I was starting to fire on all 8 cylinders. Ian met me at 7.00 a.m. outside the hotel. It was a fresh morning again, but did not as cold and certainly not the low lying fog as was the case the day before on the Saturday morning. I would highly recommend the Orroroo Hotel, which was established in 1877. The owners Warren & Liz Campbell are very friendly. 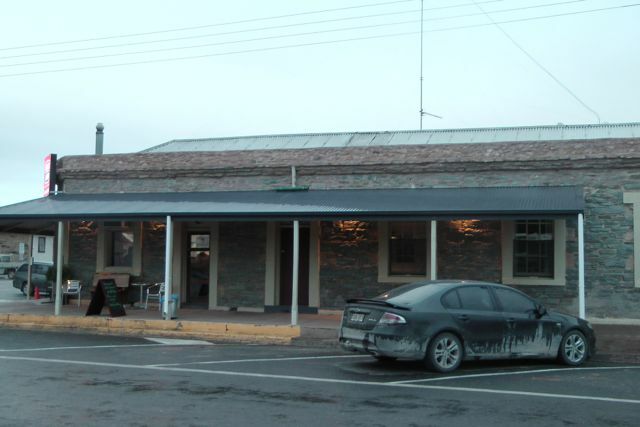 There are 2 hotels in the town, but the Orroroo is referred to as the ‘top pub’. 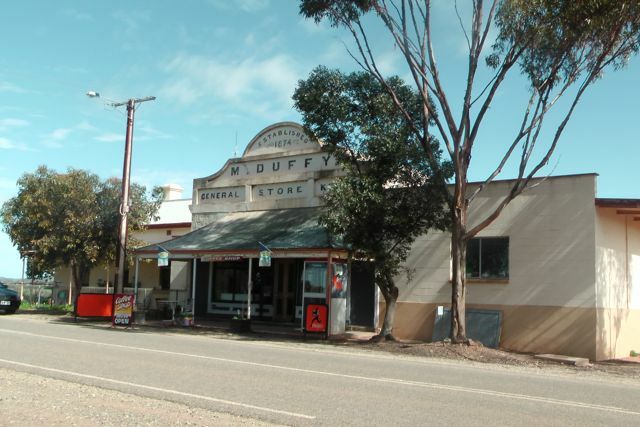 More info on the pub can be found at…..
As we were going to be travelling south out of Orroroo, Ian and I decided to take both cars. That way at the end of the 2 activations, Ian could head home to Clare, and I could head home to the Adelaide Hills. So we checked our gear and drove south out of Orroroo on the Orroroo to Pekina Road, towards the little township of Pekina. 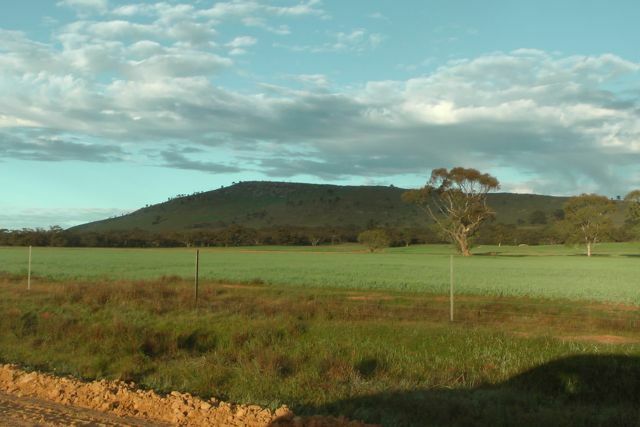 Pekina township is located about 14 km south of Orroroo. It is a tiny town with a population of only 172 people that live in the town itself, and the surrounding district. Nowadays the town consists basically of a general store, established in 1874, and a hotel which was established in 1877. The name of the town is thought to derive from the local Aboriginal word for “creek water” . European settlement in the Pekina district began in earnest in 1846 when Price Maurice brought 3000 sheep to the district. 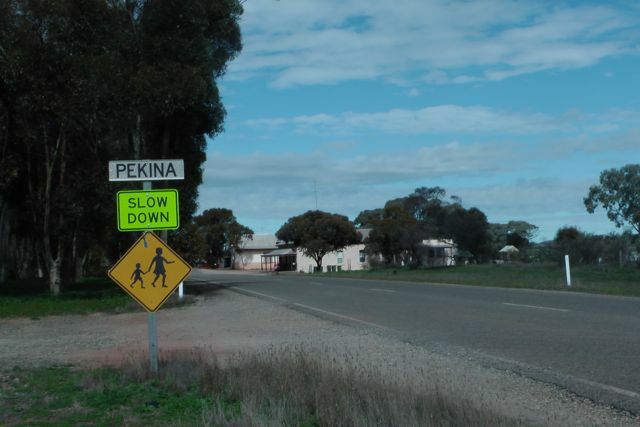 The Pekina station was one of the most profitable sheep runs in South Australia. Pekina became a stopping-point for coaches on the run between the mining towns of Blinman and Burra to the north. By 1871, the station was resumed and broken up for closer settlement. The Pekina region was settled by German and especially Irish migrant farmers. However, problems with drought, rust (fungus), and locusts during the 1880s meant the town grew slowly with only around 75 residents at the turn of the 20th century. As we approached Pekina, Hogshead Hill summit to the east & the adjacent summit, Maurice Hill to the west, were clearly visible on either side of the Pekina Road. Hogshead Hill was named by Johnson Frederick ‘Fred’ Hayward in 1846 after the resemblance of the northern end of the hill to to a hogshead barrel. A hogshead is a large cask of liquid, or less often, of a food commodity. More specifically, it refers to a specified volume, measured in either imperial or US customary, primarily applied to alcoholic beverages such as wine , ale or cider. 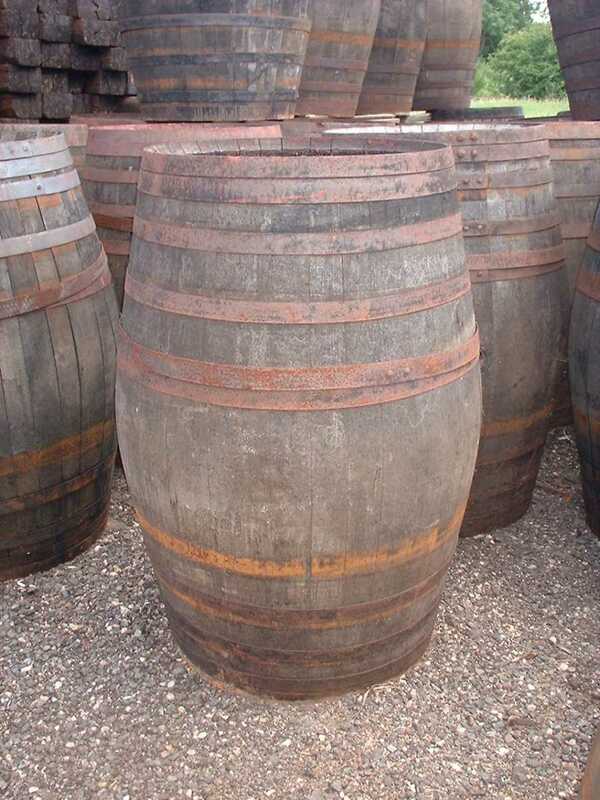 Below is a photo of a Hogshead barrel. 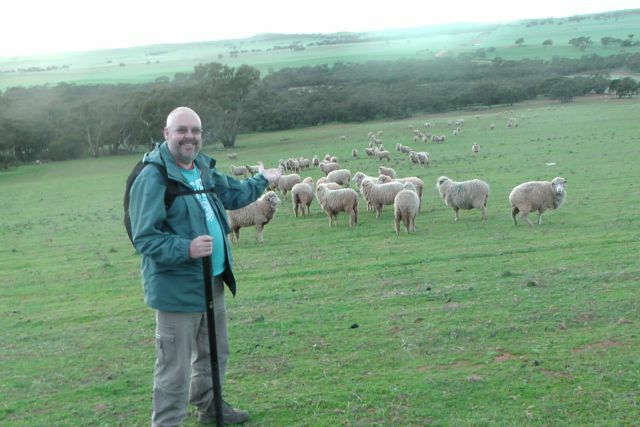 Hayward was the Manager of Pekina Station at the time and was one of South Australia’s early pastoralists. In an 1865 article in The Register newspaper relating to the death of his wife, Hayward was referred to as ‘a fine type of English gentleman’. I kept looking at the hill to see the similarities between it and a barrel, but I could not see it myself. Maybe I didn’t have enough beers at the hotel the night before. We continued south out of Pekina on the Pekina to Tarcowie Road. A few km out of Pekina, we turned left onto Stokes Hill Road which is a dirt toad, and then right onto Hogshead Road, another dirt road. We travelled along the Hogshead Road for about 5 km, up over a rise and into the scrub on either side of the road. Soon after we passed Naren Road on our left, and shortly after there was an old house ruin on the left. Directly opposite the ruin is a farmers gate. This is the access point to the summit. Please note that the summit is located on private property. So please obtain permission before entering onto the land. I parked my Falcon just inside the gate, and Ian and I then drove through the mallee scrub and into the paddock following the track alongside the creekline. There was a large number of ewes in the paddock with their lambs. Many of those were very young. We reached a fenceline at the western end of the paddock, and parked the 4WD here and unloaded our backpacks from the car. We then scrambled over the barbed wire fence, ensuring we didn’t do ourselves an injury in the process. We walked the rest of the way to the summit, a distance of about 1 km. The walk to to the top of the hill is not too strenuos and took us about 45 minutes. We tried to follow the sheep tracks as they always seem to know the easiest way along the hills. The hill is covered in moss rocks, so it was a slow and steady climb. 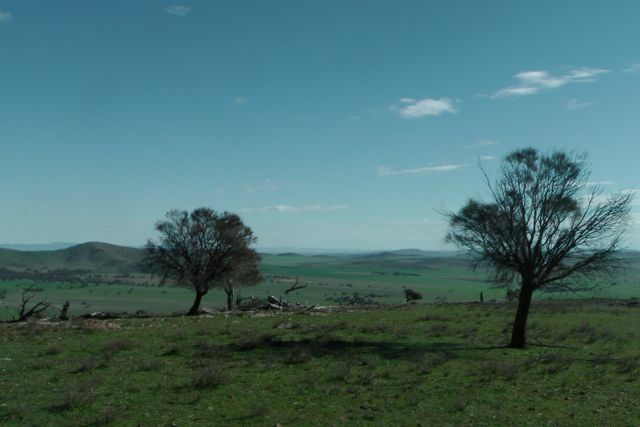 While climbing the eastern side of the hill, there were very nice views out to the east towards Peterborough and Black Rock, and north towards Orroroo. 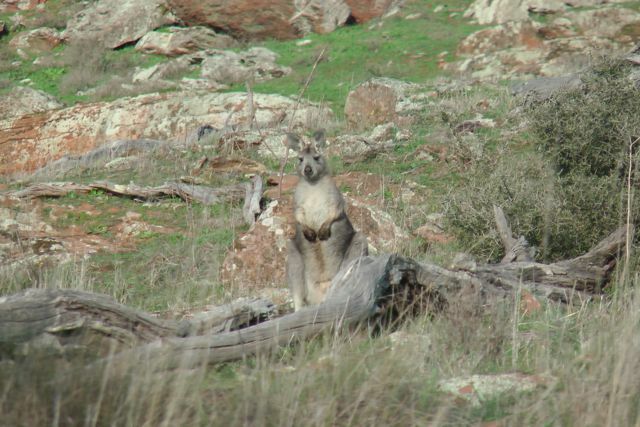 On our climb up we spotted a number of Euros (wallaroos). But one in particular appeared to be more interested in us, than we were of him. Rather than bounding away up into the rocks like his mates did when they spotted us, this little guy kept coming closer and closer to us, to find out who was encroaching on his territory. 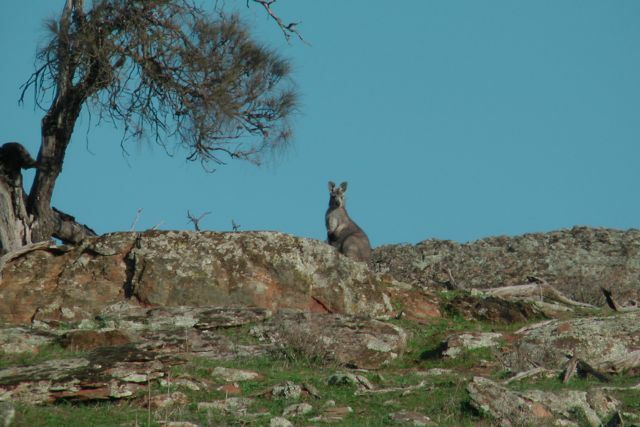 Eventually he became camera shy and bounded off, up to the top of the summit to join his friends. The climb up to the summit was no less rewarding than any other summit that I’ve climbed since starting SOTA in March this year. There are terrific views from the top in all directions. The top of Hogshead Hill is unique, in that it is relatively flat, and is similar to a plateau. It is rocky up the top with a few small trees and shrubs. But is is quite exposed and there is no significant cover. Fortunately the day was beautiful, with bright sunshine and a relative wind coming from the west. There isn’t a trig point, but there is a substantial stone cairn. And alongside the cairn is another one which is obviously in the process of having stones & rocks added to it as more people climb up to the summit. Ian and I set up just down from the summit itself, using a fencline to our advantage, as a support for the squid pole. We found a nice sturdy permapine post and attached the squid pole to this with some octopus straps. We strung out Ian’s home brew 40m/20m linked dipole and weighted down one of the legs with some moss rocks, and tied off the other end to a small shrub. There was certainly no shortage of rocks on the top of this hill. We found a dead tree limb lying on its side alongside the fence, not far from the permapine post, and this looked like a nice seat. I set up my Yaesu FT-817nd, with Ian’s Elecraft KX3 at the ready. During the course of the weekend I had lost the DC cable for the radio, so I was relying on the internal NIMH battteries lasting the distance. Ian and I had made it to the top of the hill at our expected time, so we stuck to our original plan that I would operate for the first hour on the hill, until the UTC roll over, and Ian would then take over for the new UTC day for all of the Chasers. And this was set to be an exciting activation as the ACT fellas were celebrating their 6 month SOTA anniversary. 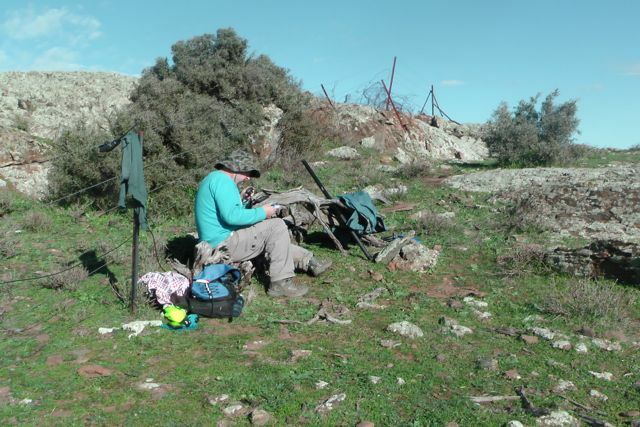 There was an expected 9 + operators who were activating various VK1 SOTA summits that morning. 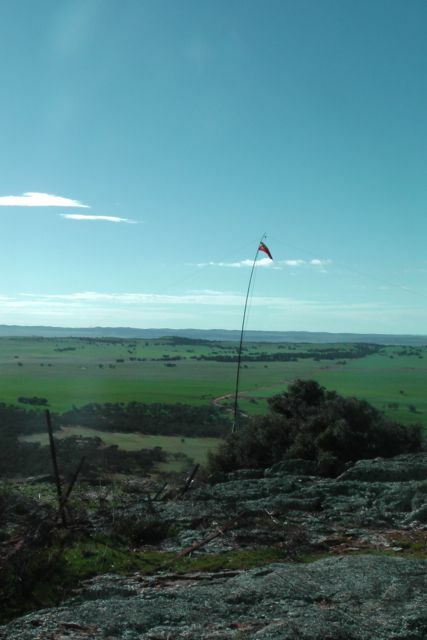 My first contact of the morning was on 40m SSB with Al, VK1RX, who was portable on Mount Tuggeranong, VK1/ AC-038. Signal reports were 5/5 both ways. What a great way to start the activation, with a summit to summit QSO between VK5 to VK1. I then QSY’d up the band slightly to 7.095 and put out a call, only to be swamped with the regular pile up of chasers. Andy VK5LA in the Riverland, Colin VK3UBY in Mildura, and Ron VK3AFW in Melbourne, made up my 4 qualifying QSO’s for the summit. Ron VK3AFW was a memorable contact for me, as my QSO with Ron, pushed me over the 100 point mark as an Activator. Thanks a lot Ron. It has been quite a challenge here to reach the 100 points. The tyrany of distance makes it difficult, but I have enjoyed every minute of my6 months of activating. I’ve printed out a special QSL card and a certificate and I’ve mailed this to Ron to celebrate my 100 Activator points. Mark, VK1MDC/p, VK1/ AC-040, Mount Ainslie. Peter, VK1IRC/p, VK1/ AC-040, Mount Ainslie. Ashley, VK2FAJG/1, VK1/ AC040, Mount Ainslie. Ed, VK2JI/1, VK1/ AC-037, Mount Taylor. Jim, VK2LC/1, VK1/ AC-037, Mount Taylor. Rod, VK2LAX/1, VK1/ AC-037, Mount Taylor. Ian, VK1DI/p, VK1/ AC-035, One Tree Hill. Another interesting contact was with Peter VK3YE who was pedestrian mobile on the beach, about 32 km south of Melbourne. Peter was QRP 5 watts and was using a home brew, hand held Magentic loop antenna. Congratulations to Peter who had a terrific 5/6 signal. And a 5/7 signal report was received back from Peter. Peter has posted a terrific video on You Tube of his beach activation on the day and his SOTA contacts. I had a few more QRP to QRP contacts including Ian VK5IS who was running 5 watts (5/6 sent & 5/4 received), Brendan VK4FADI who was also QRP (5/8 sent & 5/9 received), Steve VK3SE who was running QRP 5 watts (5/9 both ways), and Tom VK2KF, also QRP on 5 watts (5/9 both ways). At the strike of 9.30 a.m. local time on my watch, which marked the new UTC day, Ian took over the reigns of the radio, whilst I took the opportunity to stretch my legs as I was getting pins & needles, take some photographs, and explore the summit. 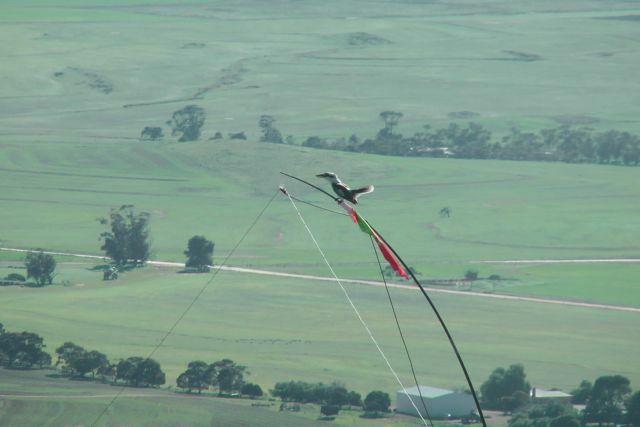 After a little over 30 minutes of exploring the summit, I started walking back towards our operating position and saw a rather large bird fly onto the top of the squid pole. I was in the process of taking a photograph when I saw the bird fly in. 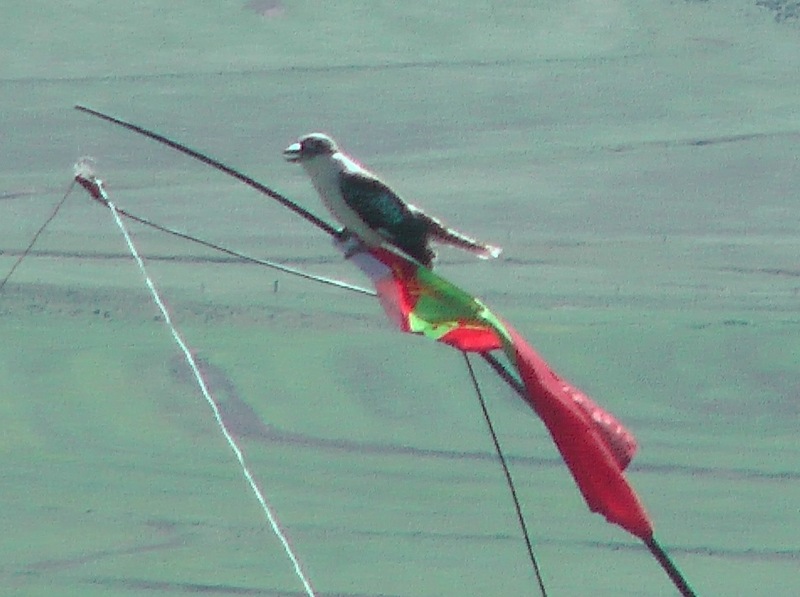 I was just far enough away that I couldn’t really tell what type of bird it was, so I zoomed in with the video camera and saw that it was a cheeky kookaburra that had decided to perch itself on the top of the squid pole, a few feet from where Ian was operating. As I got a bit closer, he/she decided to fly off, and as it did it let out its distinctive laughing call. It wasn’t until I got back to our operating spot, that Ian said he had noticed a drop in signal strength and that he hadn’t seen the bird. Andrew VK1NAM/p, VK1/ AC-032, Castle Hill. Mark VK1MDC/p, VK1/ AC-040, Mount Ainslie. Peter VK1IRC/p, VK1/ AC-040, Mount Ainslie. Peter VK3PF, VK3/ VT-026, Mt Toorongo Range. Matt VK1MA/p, VK1/ AC-023, Mount Coreee. My iphone went off with the goat bleating from SOTA Goat and it was a spot for Andrew VK1NAM calling CQ on 6m. Ian and I got quite excited, and we did have a listen and put a call out, but sadly we didn’t hear anything. After an hour or so of operating on the summit, it was time for us to head down and drive to the next summit. Ian and I had a total of 71 QSO’s in the log, including 20 summit to summit contacts. What a morning ! And congratulations again to the VK1 SOTA Association. 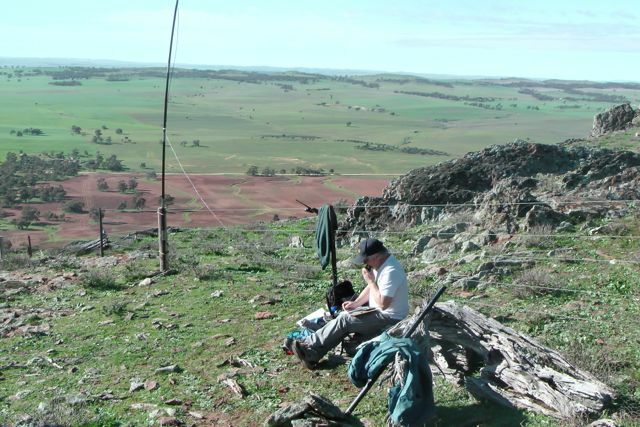 I worked the following stations on 40m SSB:- Al VK1RX/p (SOTA); Andy VK5LA; Colin Vk3UBY; Ron VK3AFW; Ernie VK3DET; Rik VK3KAN/m; Nev VK5WG; Tony VK3CAT; Mark VK1MDC/p (SOTA); Peter VK1IRC/p (SOTA); Ian VK5IS/qrp; VK4FADI/qrp; VK2FAJG/1 (SOTA); Scott VK7FTTT/qrp; Larry VK5LY; Glenn VK3YY; Peter VK3FPSR; Warren VK3BYD; VK5MKA; VK3JM; David VK3KR; Andy VK5AKH; Adam VK2YK; Ed VK2JI/1 (SOTA); Steve VK3SE; Rob VK2FROB; Phil VK3BHR; Tom VK2KF/qrp; VK2LC/1 (SOTA); Shaun VK5FAKV; Brian VK5FMID; Rod VK2LAX/1 (SOTA); Theo VK5MTM; Ewen VK3OW; Peter VK3YE/ped mobile; Ian VK1DI/p (SOTA); Marshall VK3MRG/p (SOTA); Andrew VK1NAM/p (SOTA); Mark VK1MDC/p (SOTA); Peter Vk1IRC/p (SOTA); Peter VK3PF/p (SOTA); VK2FBKT/qrp; Rik VK3KAN; Matt VK1MA/p (SOTA); and Roy VK5NRG.